Mashable introduces its own social layer called “Mashable Follow”. The new social layer is its beta stage. Hope this new social layer will help mashable readers to scale down the whole website into a section that only provides the kind of information they’re most interested in. 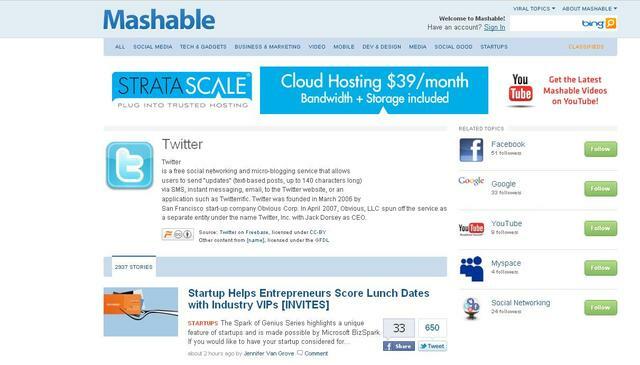 Social curation is the one area that is being focused by mashable. Easy log-in: Log in to Mashable with your Twitter or Facebook account – no need to create a new one! Follow topics: The new “Follow” buttons on every story let you subscribe to those topics via your “My Stories” feed (and coming soon, e-mail!). Whenever we publish a story matching your topics, you’ll be notified. Simple sharing: Given that the Mashable community loves to share, we wanted to make sharing our stories even easier – so we did! Mashable Follow allows readers to add their Facebook, Twitter, Google Buzz and Digg accounts (and more coming soon!) to their profile pages and share to all of these services in a single click. Profile pages: Mashable Follow also lets you create a profile page on Mashable, promote all your social media accounts, and connect with other Mashable community members who share your interests. Badges: For a bit of fun, Mashable members can now earn badges for sharing stories, connecting with other Mashable users, commenting on articles, following topics and more. Over time, we hope to create more substantial rewards for our most engaged readers, awarding more influence to our most dedicated community members and allowing them to set the news agenda. I hope that Mashable Follow would help Mashable achieve its social ambitions including community powered news. Please visit www.mashable.com/follow and be part of the community powered news revolution. Will be interesting to see if this catches on. Mashable has a huge following and this seems like a great idea. @Zack Thanks for the feedback. I do also like to watch how the new changes will affect the readers of Mashable. Hope it going to help all the Mashable users to sort posts based on their interest. These are brilliant tips you have shared regarding the proper use of Twitter and Face-Book account, we all know that this can be use by online marketers for their own business. aside from that this social networking site means a lot to many people. it is a great! step by mashable!